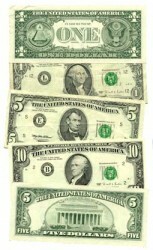 When you first saw this did something seem strange?, maybe even subconsciously? Flight 175 seems to melt into building. Well maybe your weren’t totally crazy and your subconcious was working just fine. Start clicking below and jump in. 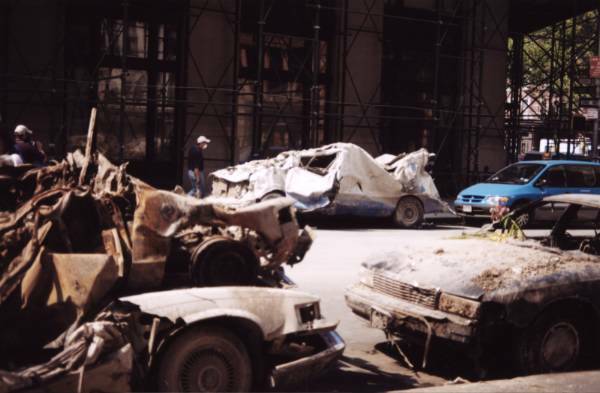 A reported 1400 vehicles were damaged on 9/11. [Reference] These vehicles had peculiar patterns of damage and some were as far away as FDR Drive (about 7 blocks from the WTC, along the East River). Vehicles had missing door handles for example, windows blown out, window frames deformed, melted engine blocks, steel-belted tires with only the steel belts left, and vehicle front ends destroyed with little or no effect on the back end of the vehicles. What could have caused such extraordinary damage? Portions of cars burned while paper nearby did not. Everything we have learned about the thermite controlled demolition of the twin towers resulting in 3000 deaths is an outright lie and put out by the government to keep us from the REAL TRUTH. Yes the government put out the story about the thermite. You will see why. This doesn’t mean 9/11 truth is dead. It just means the focus needs to be totally changed. Everyone has it all wrong. When Swedish doctor Uffe Ravnskov wrote his book the “Cholesterol Myths” in 2000, few people were publicly making the assertion that saturated fat does not cause heart disease. (OK, well, the non-profit Weston Price Foundation and its founders Sally Fallon and Mary Enig, Ph.D., were, but they were often dismissed as being a fringe group.) But today, several prominent voices are saying exactly that—author Nina Planck, science writer Gary Taubes, and journalist Michael Pollan among them. In an effort to better understand this controversial issue, I interviewed Dr. Ravnskov, who lives in Lund, Sweden, and who has just published a revised edition of his book, called, simply, Fat and Cholesterol are Good for You . He is also founder of the International Network of Cholesterol Skeptics. Hannah Wallace(Interviewer): What kind of doctor are you? Uffe Ravnskov: I am a specialist in internal medicine and nephrology. I have studied the cholesterol issue for twenty years and published more than 80 scientific papers and letters about the subject and have also written two books in five languages. HW: You’ve said that the “cholesterol campaign” is one of the greatest mistakes in medical science. Can you briefly define what you call the cholesterol campaign and tell us why you believe it’s a mistake? UR: The cholesterol campaign is based on the false idea that [human consumption of] animal food and high cholesterol causes atherosclerosis and heart disease. It’s a mistake because high cholesterol is not dangerous to health; it is beneficial. For instance, high cholesterol protects against cancer and infectious diseases. Today millions of healthy people all over the world are taking medicine that may create muscle weakness, bad memory, bad temper, impotency, painful legs and cancer. But most doctors do not know it because they have been mislead by the drug industry and their researchers. HW: But what about all the research that shows that diets high in saturated fat cause heart disease? UR: No study has ever proved that saturated fat causes heart disease. More than 30 studies have shown that heart patients have not eaten more saturated fat than healthy people and at least 8 studies of stroke patients have found that they had eaten less saturated fat than healthy controls. HW: It seems to me that there are two arguments being made here, and the distinction is, I think, important. Are you saying that eating high cholesterol foods does not raise blood cholesterol levels? Or are you saying that high serum levels of LDL (the so-called “bad” cholesterol) do not cause heart disease? UR: Eggs are the most cholesterol-rich food because a lot of cholesterol is necessary to create a healthy, living creature. You can eat twenty of these cholesterol bombs per day and yet keep your cholesterol normal. Even if your cholesterol levels should go up, there is no reason to be afraid because high cholesterol is not the cause of heart disease. Recent American studies have found that on average patients with an acute heart attack had lower cholesterol than normal and the risk of being dead three years after a heart attack was highest among those with the lowest cholesterol. HW: In your mind, what are two of the strongest studies that contradict the theory that higher serum LDL levels causes heart disease? HW: In Michael Pollan’s book In Defense of Food , in his chapter on “The Melting of the Lipid Hypothesis,” he describes a study that implicates trans-fats as the culprit for causing heart disease. Gary Taubes believes refined carbs are to blame. What do you think causes heart disease—is there another hypothesis that you think has more science behind it than the current lipid hypothesis? UR: There is general agreement that atherosclerosis is an inflammation in the arterial wall, and also that bacteria and virus participate in some way, but few have realized that it is the microorganisms that may cause the inflammation. This is a hypothesis that I have presented together with Kilmer McCully, who discovered the association between high homocysteine and atherosclerosis. Our arguments, and we think they are very strong, were presented in a scientific paper this year and in a popular way in the last chapter of my new book. They are based on the fact that the lipoproteins, including the “bad” LDL, participate in the immune system by binding and inactivating bacteria, virus and their toxic products. HW: And which study or studies do you think are the most convincing in showing that LDL cholesterol actually protects against infectious disease? UR: If you inject bacterial toxins into rats they die almost immediately, but if you start by injecting them with purified human LDL, most of them survive. Normal mice die also, but mice with high cholesterol survive. Many studies have also shown that people with low cholesterol are at a greater risk of being infected than people with high. Here is the latest theory I can find ,which also debunks all previous theories. The “no plane theory,” promoted by internet-only videos like 911 Taboo, asserts that this shot of the second impact, taken from a news helicopter, depicts a video composite of a Boeing 767 accidentally appearing from behind a Layer Mask. Nico Haupt and former chief economist within the Labor Department under the Bush administration, Morgan Reynolds, argue that no planes were used in the attacks. 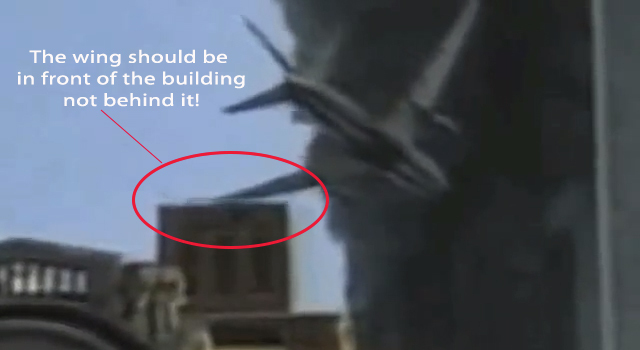 Reynolds claims it is physically impossible that the Boeing planes of Flights 11 and 175 could have penetrated the steel frames of the Towers, and that digital compositing was used to depict the plane crashes in both news reports and subsequent amateur video. “There were no planes, there were no hijackers,” Reynolds insists. “I know, I know, I’m out of the mainstream, but that’s the way it is.” According to David Shayler, “The only explanation is that they were missiles surrounded by holograms made to look like planes,” he says. 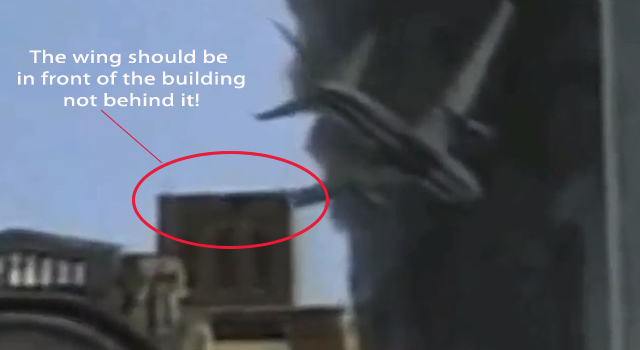 “Watch footage frame by frame and you will see a cigar-shaped missile hitting the World Trade Center.” Truth movement veterans have repeatedly refuted the “no-plane” claims. Discussion of no plane theories has been banned from certain conspiracy theory websites and advocates have sometimes been threatened with violence by posters at other conspiracy theory websites. Everything you’ve ever been told about Global Warming is probably untrue. These films blow the whistle on the biggest swindle in modern history. We are told that ‘Man Made Global Warming’ is the biggest ever threat to mankind. There is no room for scientific doubt. Well, watch this film and make up your own mind.